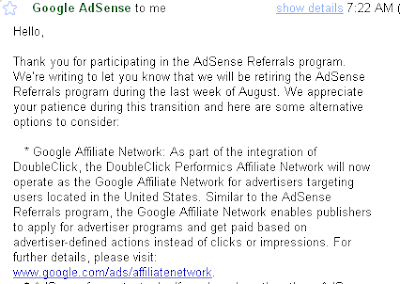 Google is retiring its Adsense referral programme. This was revealed in a mail mailed to me by Adsense today , which means soon the referral ads that were showing onto your sites would disappear by August end. They haven't particularly notified of any reason to do so, but have given a general reason of long term planning. Maybe the Referral program was not useful as against adsense for content. So Beginning September there would be no adsense referral ads being served and just white spaces may remain. They have given a few Tips and possible advices what we can do for this. > If you have less than 3 adsense for content ads per page, you can replace referral ads by AFC ads. > Save your adsense referral reports onto your desktop, as they would not be available after October.